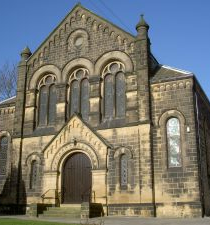 We hold a monthly service at The Borrins, on Station Road, Baildon, on the second Wednesday of each month. The service lasts around 20 minutes and consists of 3 hymns, readings, prayers and a short talk. We have been leading this worship for 4 years now. 6 volunteers from Baildon Methodist Church attend and take part in the worship. We usually have 10-15 residents attending. The staff also join us when they can.